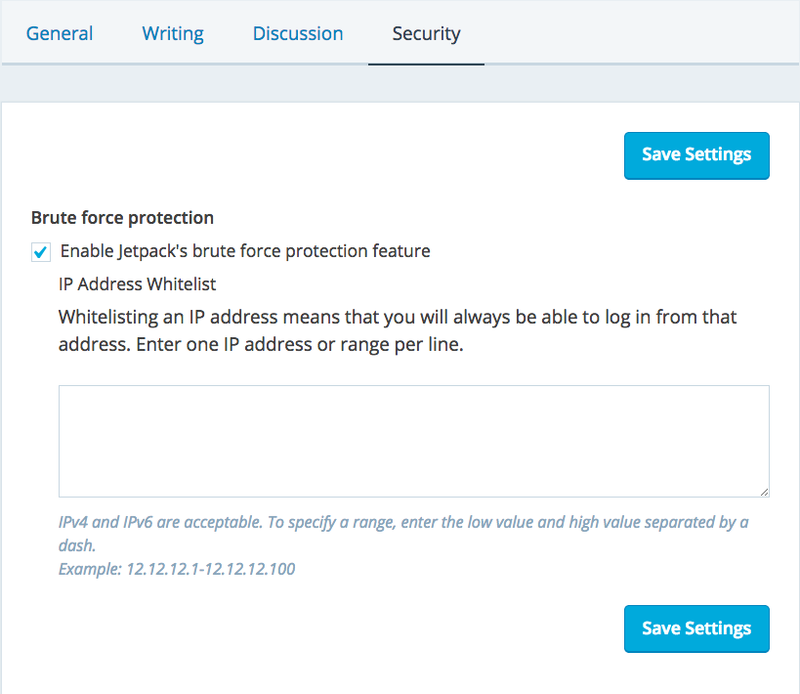 With Jetpack 3.4, we’ve added new security features to protect your Jetpack-connected WordPress sites from bot net attacks. We’ve also taken some first steps to create a simplified interface for how you interact with Jetpack. Brute force attacks are a growing concern for many website administrators. By integrating features from the WordPress plugin BruteProtect, Jetpack Protect can help you take control of site security and protect your site from this common attack vector. Continuing Jetpack’s mission to bring feature parity between self-hosted WordPress sites and WordPress.com, you will soon be able to manage security features from either your site’s dashboard or a central interface on WordPress.com. Locked out of your site from too many failed login attempts? You can whitelist your IP address in WordPress.com. With the click of a button, you can immediately boost performance, security, and engagement to jump start your site with a curated set of Jetpack modules. This feature is tailored for those who are new to the plugin or new installation of Jetpack. Visit the Plugins page in your Dashboard and update Jetpack from there. Alternatively update all your sites in bulk from wordpress.com/plugins/jetpack. You can install Jetpack by visiting our install page or by searching for it in your Plugins page on your dashboard. Please give us your feedback by leaving a comment and letting us know what you love or what you’d like to see in future updates. If you find any bugs or issues, please file a new issue on GitHub, create a new forum post, or simply contact our support team. This entry was posted in Releases and tagged Protect, release, Security. Bookmark the permalink. 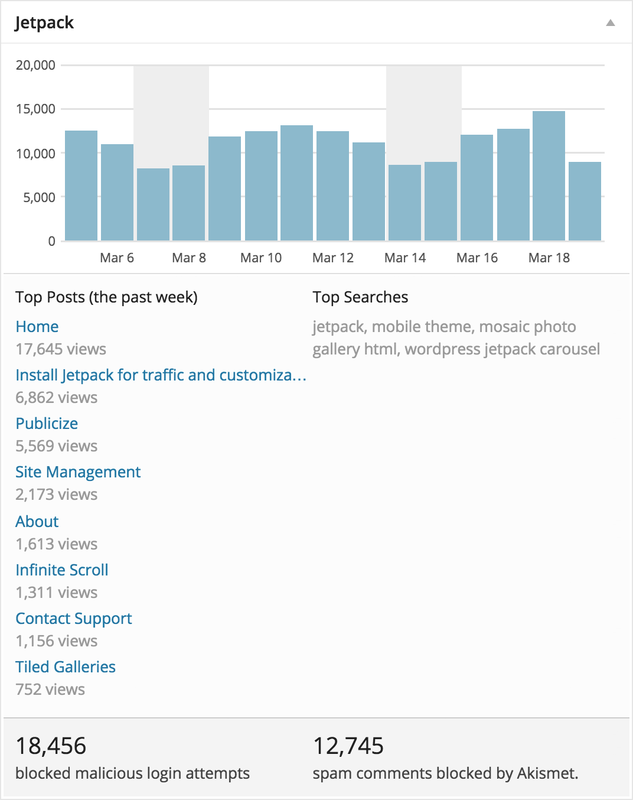 I have a question – I have two self-hosted blogs – I have the Wordfence plugin installed on BOTH blogs – do I have any reason to be concerned about the updated Jetpack plugin crossing with that, affecting the function of Wordfence – and of the blogs? Thanks! This should not be a concern. Thanks for using Jetpack! If I am already using the Brute protect plugin is it safe top remove it now that jetpack has it integrated? Hi! Yes, you can remove the Bruteprotect plugin now, as its functioanlity is now part of Jetpack! This is awesome! Keep up the great work! Question: If we have BruteProtect installed, has all functionality been duplicated and should we then remove BruteProtect or should we continue to run it alongside Jetpack? Thanks! I just did the update and noticed that BruteProtect is deactivated, but still showing up in the list of plugins. Should we delete the BruteProtect plugin? Yup, you can go ahead and delete it now! Congrats on the BruteProtect integration! For those of us with pre-existing installs of BruteProtect, is there a ‘best way’ of upgrading to the new Jetpack? Hi! We’re aware of this and working on a fix. Thanks for the report! How many bad logins must occur before an IP is blocked, and how long will it be blocked? Hello! It’s not a set number, but based on how fast they’re submitted, along with other factors. You can also whitelist IP addresses either in the plugin or on WordPress.com – please see http://jetpack.me/support/security-features/#unblock for more info. Hope this helps! Where is the “Allow remote actions” setting? I’m not seeing it. Hey! That setting was part of the 3.3 release and has since been retired. Once the Manage feature is activated it’s on. I like that the Brute Protect new functionality in JetPack is an additional login protection. Over the past week or so, someone broke into some of my sites and seemingly changed the wp-login and wp-admin code. So…I was seeing the “please prove you’re not a bot” equation but it has disappeared again. I am using both Firefox, Safari, and Chrome browsers on a Mac using OS X Yosemite and Firefox browser on a PC using Linux. Shouldn’t I be seeing the equation on the login screen? I’ve only seen the equation once this morning (both machines, all browsers) and it has now disappeared on login screens for my three affected sites. Already reinstalled current version of WordPress as well just in case. Thoughts?